In this post I will show you how to setup a cicd pipeline using drone to build a jekyll site and deploy to docker swarm. 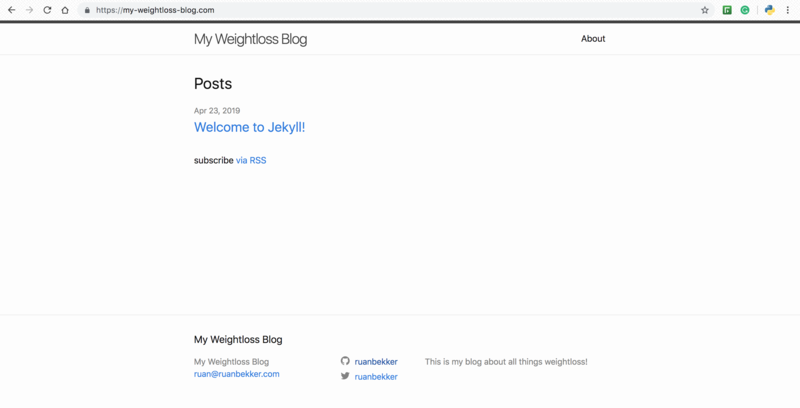 Install Jekyll locally, as we will use it to create the initial site. I am using a mac, so I will be using brew. For other operating systems, have a look at this post. I will be demonstrating with a weightloss blog as an example. You should see your data on your github repository. 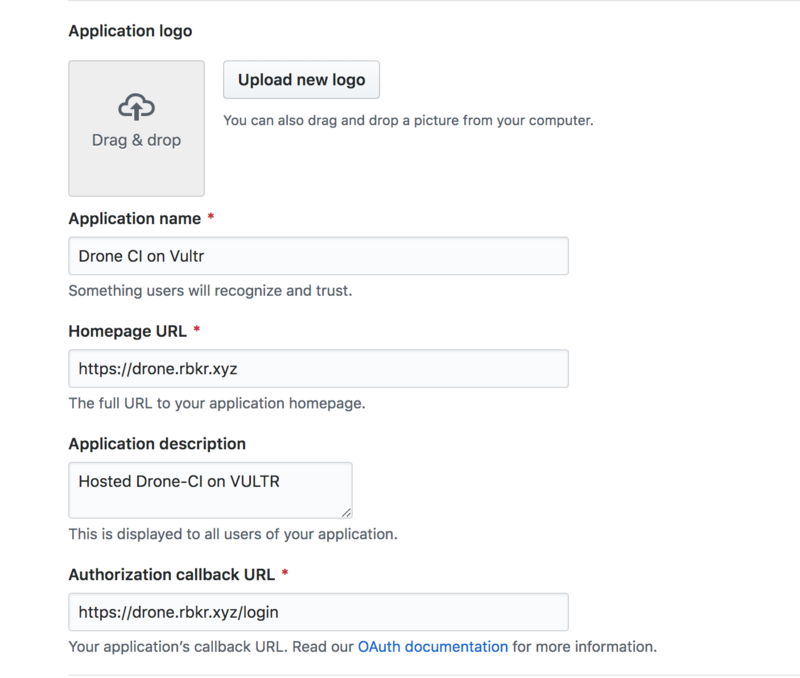 Logon to the Drone UI, sync repositories, activate the new repository and head over to settings where you will find the secrets section. If you want to be notified about your builds, you can add a slack notification step as the last step. To do that, create a new webhook integration, you can follow this post for a step by step guide. 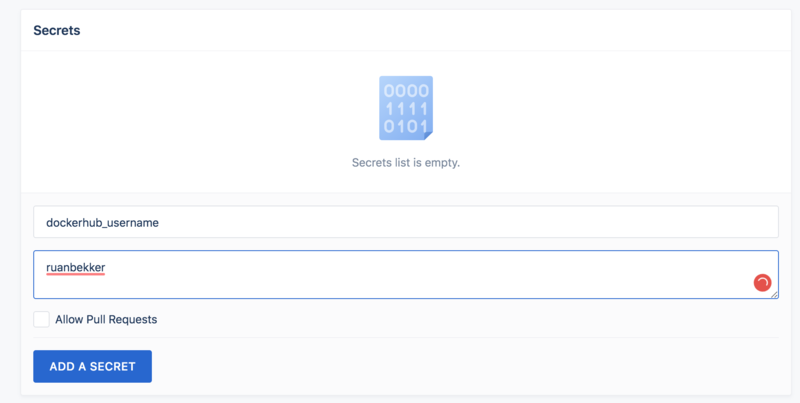 After you have the webhook, go to secrets and create a slack_webhook secret. 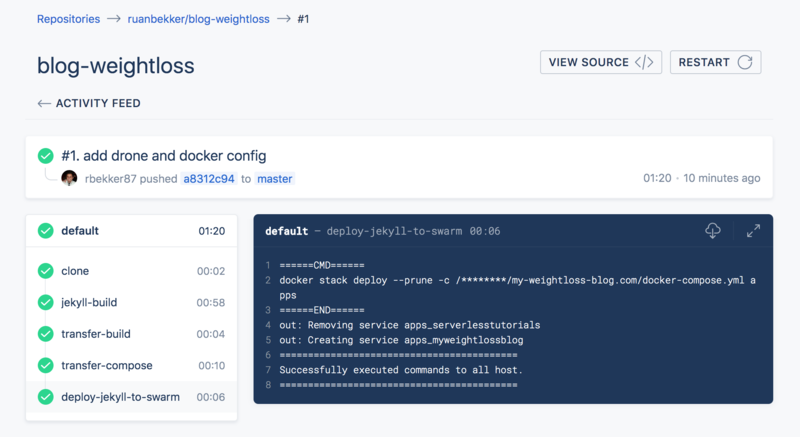 Now we need to push our .drone.yml and docker-compose.yml to github. Since the repository is activated on drone, any push to master will trigger the pipeline, so after this push we should go to drone to look at our pipeline running. 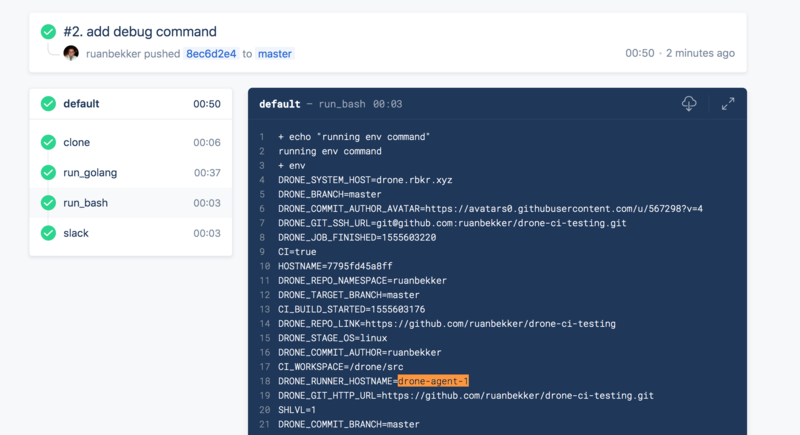 $ git commit -m "add drone and docker config"
Absolutely Amazingness! I really love drone! In this post we will setup a blog on hugo and using the theme pickles. 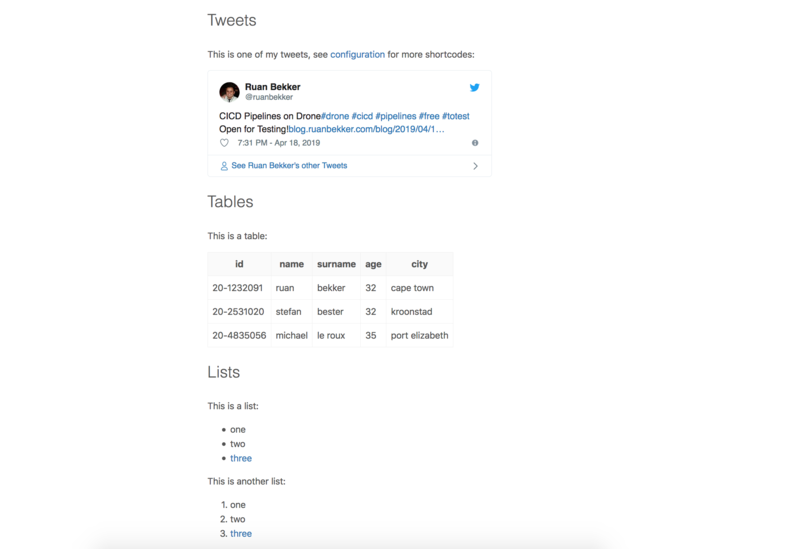 Hugo is a Open-Source Static Site Generator which runs on Golang. description: This is an introduction post to showcase Hugo. This is a new beginning on my blog on hugo and this seems pretty cool so im adding random text here because I dont know **what** to add here. So im adding a lot more random text here. 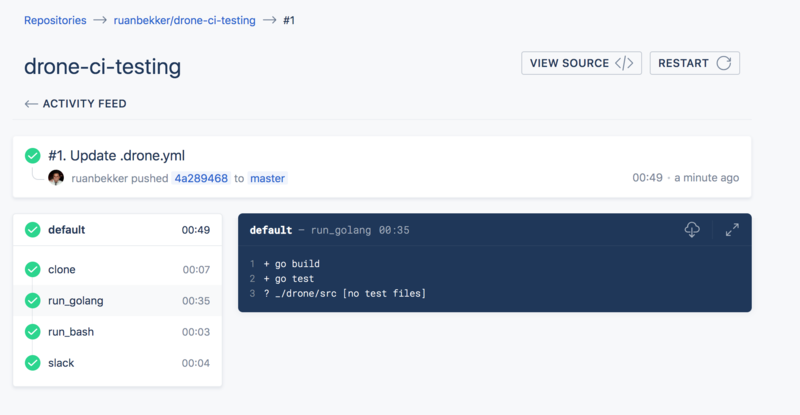 destFile = "largedataset-" + timestart + ".txt"
Drone is a self-service continuous delivery platform which can be used for CICD pipelines, devopsy stuff which is really awesome. With Configuration as Code, Pipelines are configured with a simple, easy‑to‑read file that you commit to your git repository such as github, gitlab, gogs, gitea etc. Each Pipeline step is executed inside an isolated Docker container that is automatically downloaded at runtime, if not found in cache. We will deploy a drone server which is responsible for the actual server and 2 drone agents which will receive instructions from the server whenever steps need to be executed. Steps run on agents. 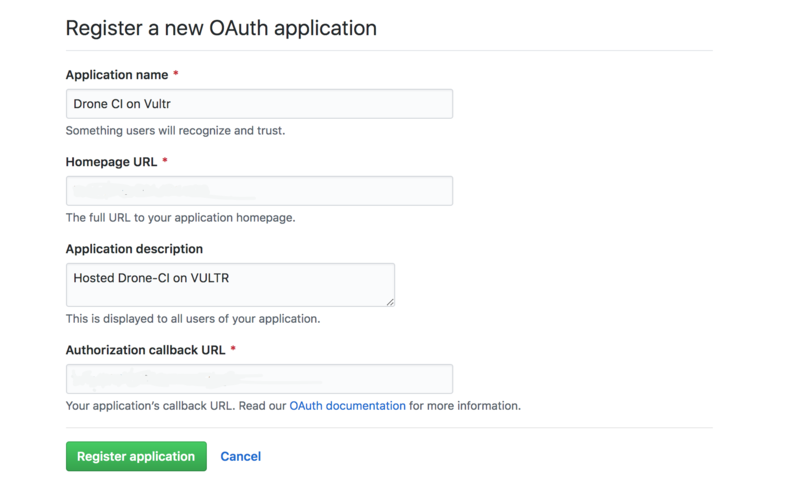 We will use Github for version control and to delegate auth, therefore we need to register a new application on Github. 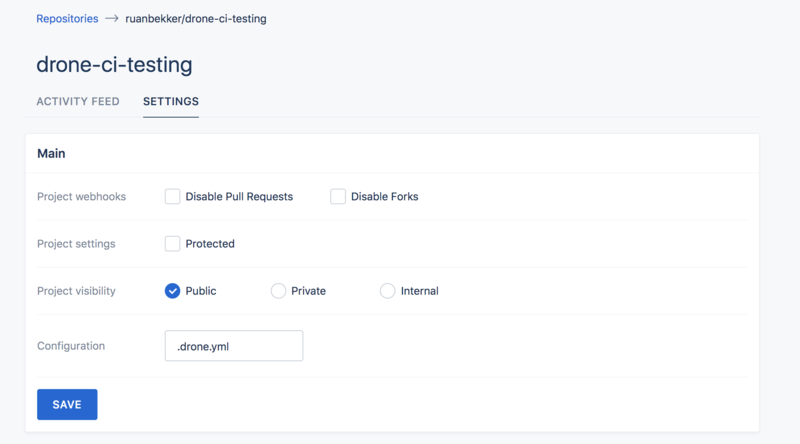 Create the Startup Script for Drone Server, which will just be a docker container running in detached mode. Note that you should use your own domain at SERVER_HOST and if you want to issue an certificate automatically keep DRONE_TLS_AUTOCERT to true. 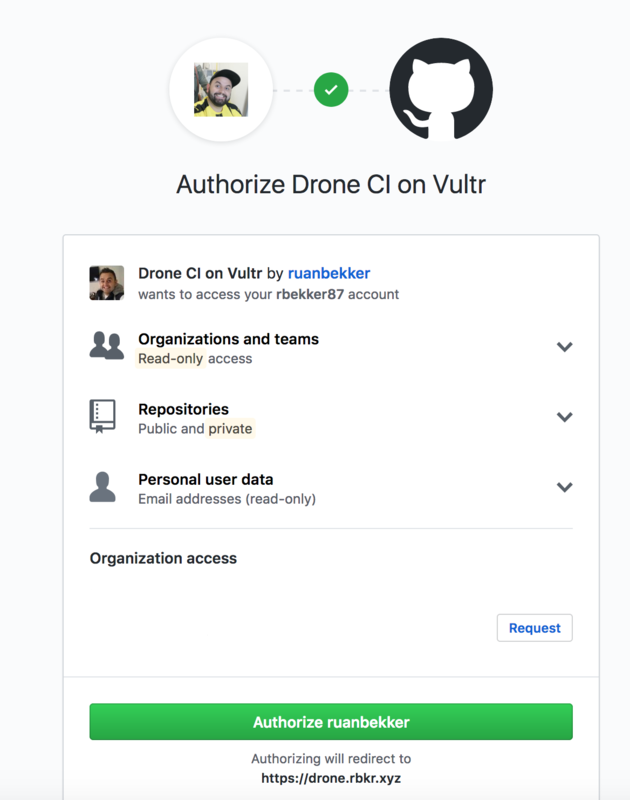 Clone this repository: https://github.com/ruanbekker/drone-ci-testing which will contain the .drone.yml config which drone gets its instructions from. If your build fails, its most likely that you need the slack_webhook secret. 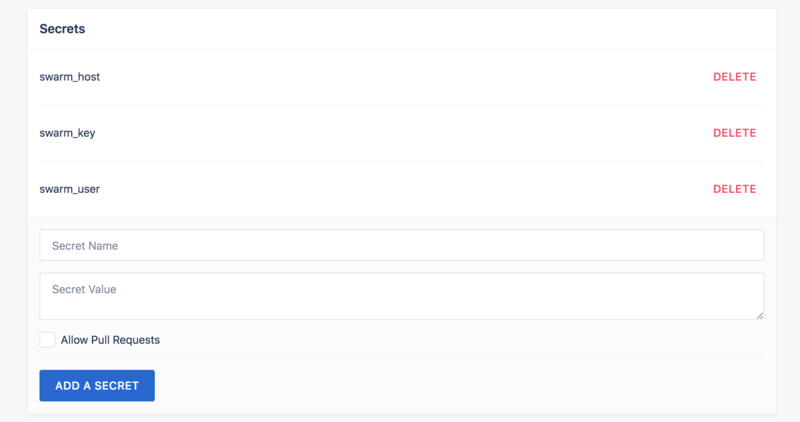 You can remove the slack step which shouldhelp you get going with drone. Have a look at this document for more examples or have a look at their documentation as well as their extensive list of plugins and their setup documentation to become familiar with their configuration. Slack is amazing and I cant live without it. We can also use custom webhook integrations to allow applications to notify us via slack in response of events. We will be configuring a custom slack webhook integration and test out the api to show you how easy it is to use it to inform us via slack, whenever something is happening. Select Add Incoming Webhook Integration. You can then further configure the integration. In this tutorial we will get started with sqlite and use inner joins to query data from multiple tables to answer specific use case needs. This is where stuff gets interesting. Let’s say you want to join data from 2 tables, in this example we have a table with our userdata and a table with transaction data. Say we want to see the user’s name, transaction id, the product they purchased and the total amount spent, we will make use of inner joins. Elasticsearch Index templates allow you to define templates that will automatically be applied on index creation time. The templates can include both settings and mappings..
We want to create a template on how we would a target index to look like. It should consist of 1 primary shard and 2 replica shards and we want to update the mapping that we can make use of text and keyword string fields. So then whenever we create an index which matches our template, the template will be applied on index creation. At times you may find that the indexes in your cluster are not queried that often but you still want them around. But you also want to reduce the resource footprint by reducing the number of shards, and perhaps increase the refresh interval. In this example we will use the scenario where we have daily indexes with 5 primary shards and 1 set of replicas and we would like to create a weekly index with 1 primary shard, 1 replica and the refresh interval of 60 seconds, and reindex the previous weeks data into our weekly index.